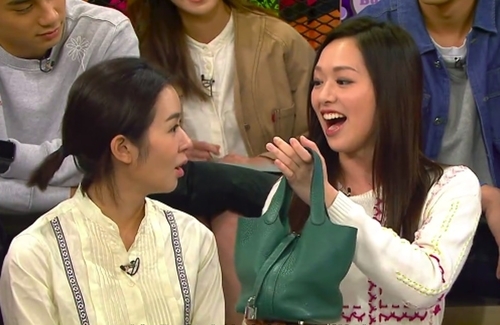 The topic of turning 18 was discussed on the latest episode of TVB variety show Young and Restless <後生仔傾吓偈>. A group of youngsters, including Crystal Fung (馮盈盈), shared how they broke free after legally becoming adults, as well as the gifts they received on their 18th birthdays. Among them, Crystal received the most generous gifts, and immediately took one of them out to show everyone. Crystal is known for appealing to middle-aged men and is dubbed as the “MK Miss Hong Kong” for her “MK” phase before joining the pageant. “MK” is short for “Mong Kok-style” and is used to describe one’s cheap and bold style – usually those with dyed blonde hair donning black clothing and tons of silver jewelry. Since the bag was far from her personal style, Crystal did not use the bag and stored it at home. Luk Ho Ming (陸浩明), also a host on Young and Restless, even discovered a plastic bag inside the Hermès. At the time, Crystal stored a blown up plastic bag inside the brand name bag to keep its shape. Unfortunately, the air in the plastic bag already leaked, which proves Crystal really does not use the bag. Even though the bag was not up her alley, she received another gift for her 18th birthday that she still treasures to this day. In a telephone interview, she disclosed her parents also got her tickets to Super Junior’s concert in Japan and even went with her. This article is written by MelodyC for JayneStars.com. omg, i totally agree. louisa’s got the brains but i really don’t think she’s got the looks for getting promoted. for crystal, i don’ t know why they keep talking about her… she just doesn’ the chrisma to be in a drama. she may pass for playing a 3rd wheel or resort to 3rd line artist, but not lead. the only news i keep hearing about these two are the outrages things they’ve said.